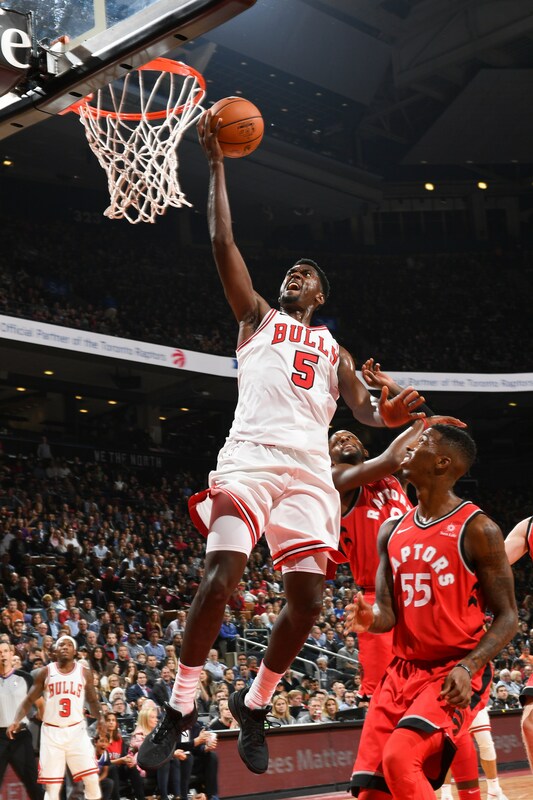 Bobby Portis Tuesday came back, he saw the Toronto Raptors and almost helped conquer them. Vini, vidi, cici; fere. Yes, only almost, as it turns out, in a 119-114 Bulls loss that was Greek to many until a 23-point Bulls deficit became a three-point difference in the fourth quarter. The Bulls would get no closer, defeated if not vanquished. Portis, returning from an eight-game suspension for his punch that fractured facial bones of teammate Nikola Mirotic, was so relieved to be back he even enjoyed the Hoiberg tongue lashing after the Bulls trailed 65-45 at halftime. Portis loved a lot about Tuesday, except for the final result, of course. But the stats in Portis’ first game were impressive, even remarkable given the time away and circumstances. 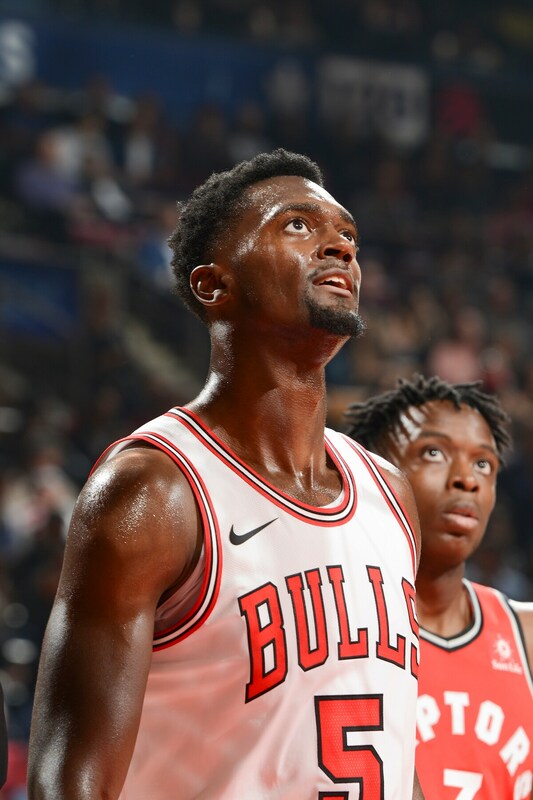 Portis led the Bulls with 21 points and 13 rebounds, making three of five three pointers and leading the fourth quarter surge with 14 of his 21 points. 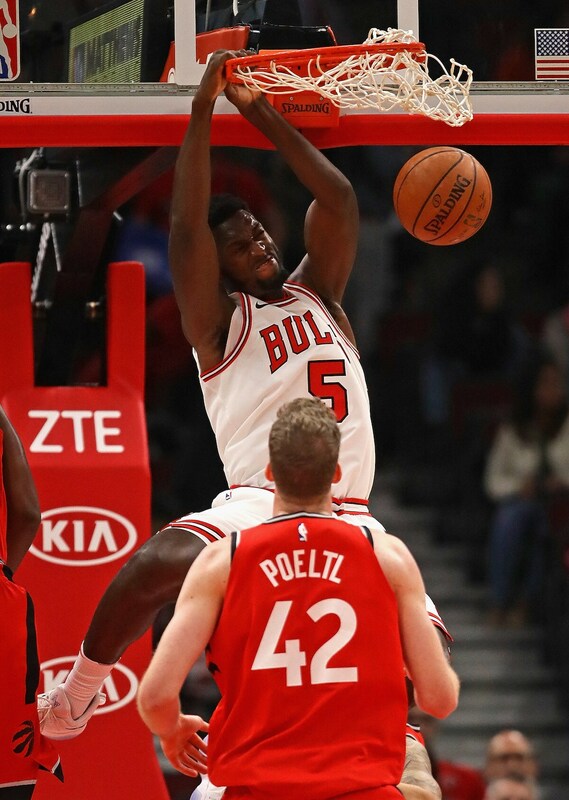 After an erratic first half with the starters--other than Robin Lopez with 20 points--constantly beaten off the dribble, Hoiberg went most of the fourth quarter with a mostly athletic, quicker group that included Portis, Kris Dunn, Denzel Valentine, Lauri Markkanen and Justin Holiday. 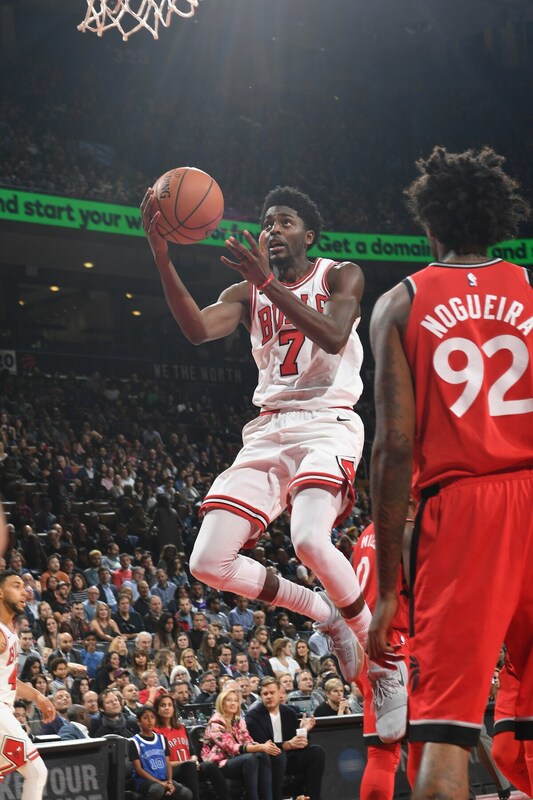 Trailing by 17 after three quarters, it was primarily that five who sliced the Toronto lead to 109-103 with four minutes left and trailed by three on a Portis turnaround in the lane with 50 seconds left. 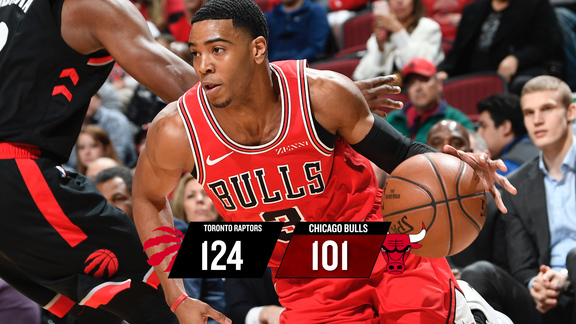 The Bulls couldn’t stop a DeMar DeRozan 12 footer and then DeRozan again after a Valentine slashing cut for a score on a Dunn pass. 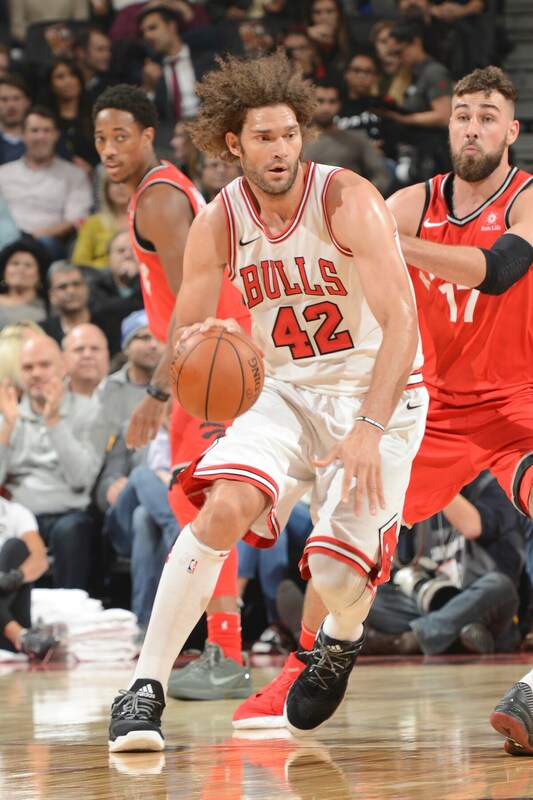 Holiday had 15 points for the Bulls, Valentine had 14 off the bench with another strong performance, Markkanen 12 and Dunn 10 points with six rebounds and four steals. DeRozan had 24 for Toronto and Jonas Valanciunas had 21 points and 10 rebounds. The Bulls are 2-7 and host Indiana Friday. The Raptors are 6-4. And everyone had to like what they saw from Portis in his first action of the season after the altercation three weeks ago in practice. Mirotic remains out, perhaps another month or more, and Portis acknowledged pregame to reporters the two had still not spoken. Portis has said he wants to repair the relationship. 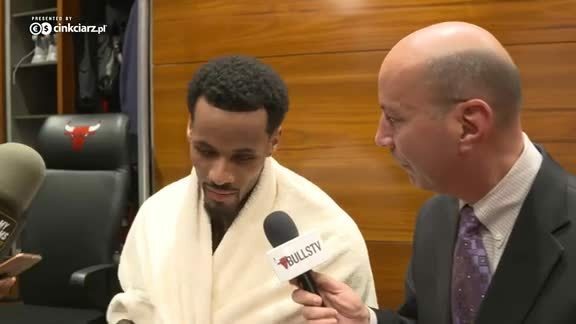 But, for now, with his return he says he has to concentrate on what he can do for the Bulls. The first impressions were impressive for the third year power forward. Portis emphasized he doesn’t care whether he starts or comes off the bench, in some sense, the motivation for the fracas. He felt he almost lost basketball, and was a man grateful to be back and have another opportunity. “I had great support from my teammates, coaching staff, my family throughout the entire process,” Portis said after the game, pulling on a pair of blue and orange socks with Phil Jackson’s picture on them. “I like Phil Jackson socks,” he didn’t actually explain. “Just tried to go out there and play the best I could and have fun,” Portis said. “It’s been a long time since I played the game of basketball. I’m not going to stop being myself; situation happened. But at the end of the day, I have to be myself no matter who is around, who is my teammates, what team I’m on. I just try to be myself in every situation I am in. Other than the efficient offensive play of Lopez early, the Bulls were constantly behind the play on defense. They resembled someone chasing a loose balloon, reaching this way and that without much success. “My scoring, especially in the first half was meaningless, because we weren’t getting stops,” said Lopez. The Raptors have adjusted their offense this season and it’s been a balky process. Instead of the steady procession of pick and rolls with DeRozan and Kyle Lowry, the ball is swinging around more. The Bulls from the start looked like they were watching a tennis match with heads swiveling this way and that. They were competent early, trailing 29-26 after one quarter thanks to Lopez making all four shots. Portis made his anticipated first appearance midway through the first quarter when Markkanen picked up a second foul. The second quarter for the Bulls was like playing third base coach. The Bulls were waving them to the basket. Hoiberg apparently delivered a vigorous condemnation that got things going for a bit after halftime with Lopez adding another 10 points. But that starting group with Paul Zipser starting for the injured David Nwaba and Jerian Grant shooting one of seven still couldn’t stop much. It was a 36-33 Bulls third quarter to trail by 17. “We had three very solid defensive games where we held teams under 100, and then this,” said Hoiberg. 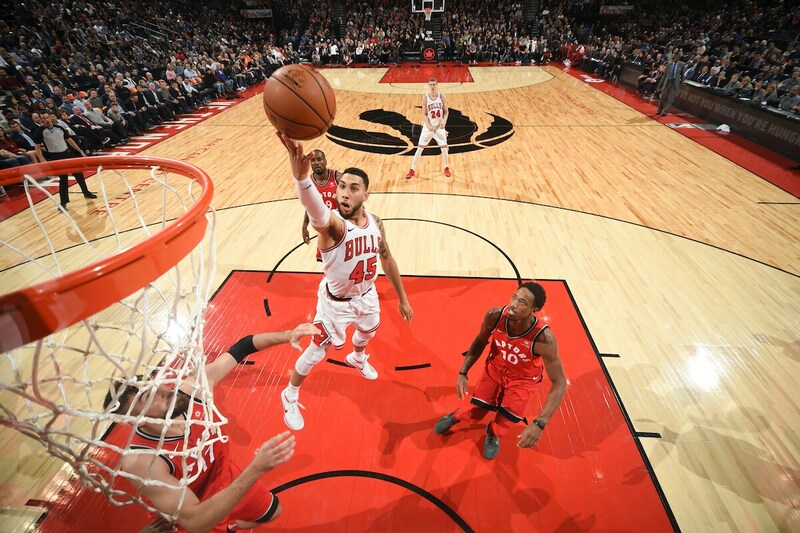 Hoiberg juggled the lineup and the Bulls finally found enough hustle and shot making to make it uncomfortable for the Raptors. It is, at least, a Bulls team that isn’t giving in or giving up, if usually overmatched. The return of the frenzied Portis helped even the sides. “I heard some things (from the crowd about the punch),” Portis acknowledged. “But I’m a mentally strong guy.